I had an absolute blast last week under the guidance of rawkstar celebrity chef Michael Vincent, attending the “Essentials Of Raw Cuisine” Weekend Intensive Cooking Class at Matthew Kenney Culinary in Santa Monica with my delightful sidekick Lauren Felts from The Holy Kale. This 12 hour course covers a lot! Talk about bang for your buck. This class is awesome! 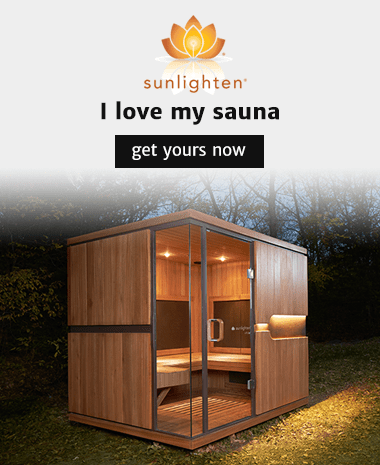 What a fantastic weekend experience for a friend, or better yet, an amazing experiential gift for that special someone in your life. They still have a few openings for the last class on December 15th and 16th, so if you are in L.A check it out! You can study with Matthew Kenney Cuisine in Los Angeles, Oklahoma City, Miami, and online. They are currently filming, and I cannot wait to see the course! So exciting. So, wherever you are in the world, you can have access to these incredible raw foods techniques. Everybody I have met from the Matthew Kenney Cuisine team are incredibly knowledgeable, kind and generous of spirit, and fun! Michael was no exception, and was an incredible instructor. He gave us a great introduction to living cuisine; shared tips about basic kitchen equipment and raw ingredients; demonstrated some fabulous flavor balancing, plating and presentation tricks; talked about the importance of soaking and sprouting nuts and seeds; cracked open coconuts; and helped us put our own individual creative spin on the famous Matthew Kenney Cuisine raw food recipes. Yes, we got to eat it all too! We made delicious Raw Almond Milk, Blueberry Bee Smoothies, Cashew-Sesame Dumplings in Coconut Wrappers with Lime Chile Sauce, Chipotle Kale Salad, Citrus Seaweed Salad, Coconut Yoghurt Parfaits, Ice Creams, and these delectable Chocolate Truffles.These truffles are so delicious, so easy, and make such incredible holiday treats and gifts, I simply had to share them with you. With this simple basic recipe, the sky’s the limit with creativity. You can make all kinds of flavorful variations that will rock these holidays! I rolled mine in all kinds of things — I tried some dried shredded coconut, raw cacao powder, chopped up goji berries, finely chopped pistachios, crushed almonds, lime zest, maca powder, and a mixture of cacao, cinnamon, and chili powder. In the photo they covered them with matcha powder! Talk about a burst of flavor in every bite. These were very popular at my holiday pot luck. I could have taken orders! Trust me, this recipe is not to be missed, and proves that raw food does not have to be difficult or time consuming. You literally blend this mixture up in minutes, chill, roll, and devour. Yep….Matthew Kenney creates magic again. Those of you who have been following me for a while would be more than familiar with my Matthew Kenney obsession: and you will be pleased to know that my glorious two-day immersion experience in his cooking school only fanned the flames of my passion for his creative genius and chic style. Everything he does is just class all the way; and with his gorgeous talented partner, Meredith Baird, (who I am now in love with too) they continue to push the boundaries of raw inspiration, and take living cuisine to new heights in spectacular fashion. They really are in a class of their own! 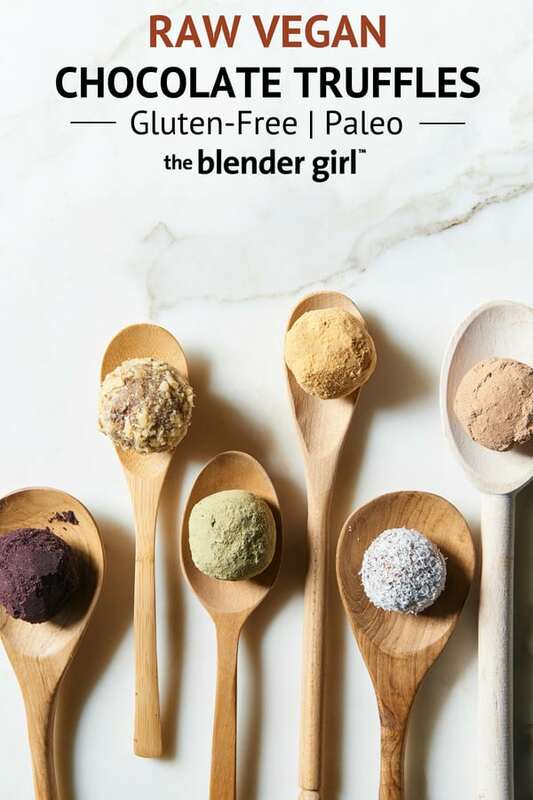 Their gorgeous new book, Raw Chocolate, is a magnificent addition to an already impressive collection of raw books which include: Everyday Raw, Everyday Raw Express, Everyday Raw Desserts, Entertaining in the Raw, and 5 Raw Dinners with Matthew Kenney. Raw Chocolate would make an amazing holiday gift. I know what my family is getting this year. Thanks Matthew and Meredith for all of the delicious decadent recipes, and thank you to the Matthew Kenney Cuisine team for the fabulous class! I can’t wait to take more. 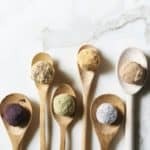 Just mix, roll, chill and devour these chocolate superfood balls with endless possibilities of coatings. Chop up the cacao butter very finely, and then place in a bowl over a pot of boiling water, and stir until melted. This only takes about a minute. You should have 1/3 cup melted cacao butter. If making homemade cashew butter, blend the raw cashews with the grapeseed oil in your blender or food processor on a high speed until smooth and creamy. Add a little more oil if needed. (Store in a sealed container in the fridge if not using right away). 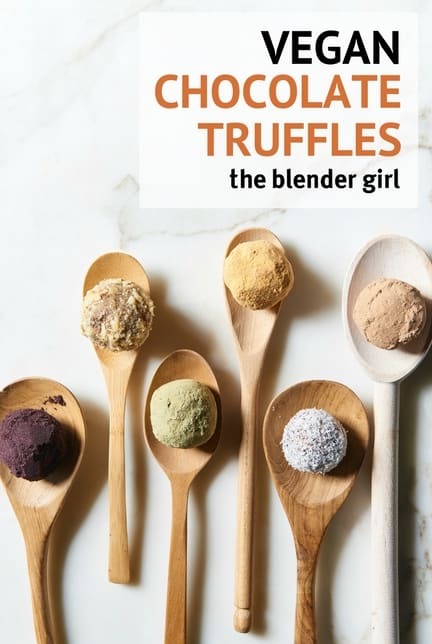 Place all your ingredients except the cacao powder into your blender and blend on a low to medium variable speed for about 10 – 15 seconds until smooth. Add in the cacao powder and blend until just incorporated. Transfer mixture to the fridge or freezer to firm up for a couple of hours. Using a small melon baller or ice cream scoop, roll into small individual balls and roll in your favorite toppings. These will keep in the fridge for about a month. But my guess is they will be gone in a day!